Marathwada has usually been about Cong vs Sena, but aggressive BJP sees an opening. Of the 46 BJP MLAs in Maharashtra, the Marathwada region accounts for just two. That makes it obvious why any strategy for a change in government will have to be anchored in these 46 seats, apart from parts of western Maharashtra where the Shiv Sena and the BJP would both look to shell the NCP’s Maratha fortresses. Following Prime Minister Narendra Modi’s first rallies for the Maharashtra elections, it’s clear now that the BJP’s pitch is for a majority government on its own. And at the heart of the number-crunching behind that pitch would be Marathwada, a fact borne out not only by Modi’s choice of Beed and Aurangabad to kick off his campaign, but also by the fact that Amit Shah too attended a huge rally of about four lakh OBCs at Bhagvangad last Friday. The event is an annual Dussehra gathering of the Vanjara community at the spot canonised by patron saint Sant Bhagvan. Shah made a political speech, asking OBCs to rally behind Pankaja Munde and pitchforking her into a mass leader. Ramping up its Marathwada presence is shrewd strategy for the BJP. Winning 30 of Marathwada’s 46 seats was critical to the Congress-NCP’s 2009 win. While parts of Marathwada — Latur, Nanded and parts of Hingoli — have been Congress strongholds for years, other areas such as Aurangabad and Parbhani have been the Shiv Sena’s only bastion outside Mumbai and Konkan. In the past, Marathwada’s big fight has been between the Congress and the Shiv Sena, barring Gopinath Munde’s presence in Beed and the more recent BJP-versus-NCP fight in the same district. Congress MP from Hingoli Rajeev Satav says the fight remains one between the Congress and the Sena. “The Congress will finish first, the Shiv Sena second,” he predicts of the four-cornered contest. His maths is that the BJP and Sena don’t have a CM candidate from Marathwada, while the possibility of Ashok Chavan as chief minister cannot be ruled out. “If the BJP is committed to Munde’s legacy, why don’t they declare Pankaja as CM candidate?” he says. There is also the Congress theory that since the NCP anyway routinely worked against Congress candidates, the impact of a four-cornered fight will be felt more by the Sena and the BJP. But the mood on the ground indicates neither the Congress nor the Sena can fully protect its strongholds. In the Nanded-Hingoli belt, the BJP has reinforced itself by roping in Madhav Kinhalkar, who had filed a paid-news case against former CM MP Ashok Chavan and other leaders. Ameeta Chavan is expected to win easily in Bhokar, but the BJP is hardly conceding defeat. Only a couple of weeks ago, sarpanchs of about 40 villages in Bhokar were being wooed by the BJP, an effort reportedly engineered by Khatgaonkar. In Nanded South, Chavan aide and sitting MLA Omprakash Pokarna is considered a strong candidate, but the BJP has fielded former Nanded city Congress president Milind Kandkurte, who recently fell out with Chavan. With a strong MIM candidate splitting the Congress’s traditional Muslim votes, Pokarna will be hoping the Dalit voters and the trader community back him. This is also the constituency with the highest number of candidates in the state — 49. In Hadgaon assembly constituency too, the Congress faces a tough challenge, what with this being Suryakanta Patil’s home ground as well as that of Subhash Wankhede, both with their own support base. In Deglur, Ashok Chavan aide and sitting MLA Raosaheb Antapurkar faces a tough contest. Not only is the outsider to Nanded seen as a non-performer, BJP candidate Bhimrao Kshirsagar could gain from the work done by Khatgaonkar locally. In Mukhed, sitting MLA Hanumantrao Patil Betmogrekar is facing opposition from among local Congressmen, over his brother Dilip Patil Betmogrekar being made zilla parishad president. In Basmath, held by the NCP, the BJP has fielded Shivaji Jadhav, son of former MLC Munjaji Jadhav known to be a loyal supporter of Indira Gandhi. “The promise of development for Marathwada because the CM belongs to the region was proven false,” says Prataprao Patil Chikhalikar, former Congressman, Ashok Chavan baiter and once close to Vilasrao Deshmukh. Chikhalikar is contesting in Loha, located in Latur, where he is challenging the sitting NCP legislator. In Beed’s six segments, Parli is the only one the BJP currently holds, the rest all held by the NCP. Two of these, Georai and Majalgaon, were won by modest margins, and the BJP is hoping the sympathy wave for Munde and anti-incumbency will swing these two. The Beed assembly seat is held by Jaidutt Kshirsagar who was PWD minister, but he faces a tougher contest from Vinayak Mete, former NCP MLC. Mete’s Shiv Sangraam was key among organisations seeking reservation for Marathas, and though his own local standing is not convincing, the BJP wave in Beed could cause an upset. 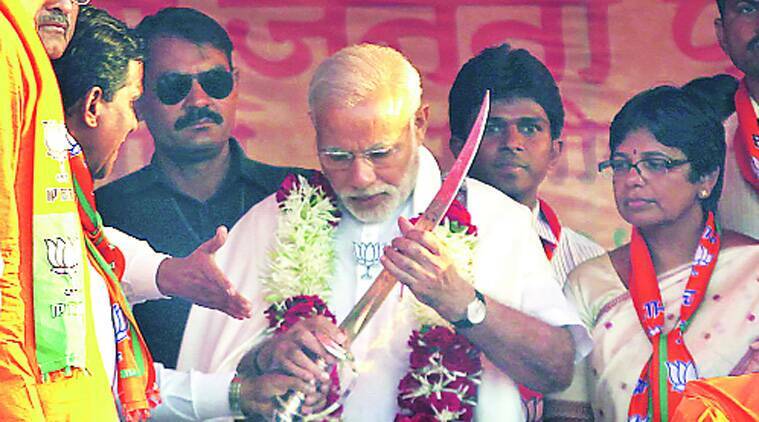 In the Aurangabad belt, where the Sena has been traditionally strong, the BJP is going all guns blazing. In Aurangabad Central, independent MLA and former Sena MP Pradeep Jaiswal is back with the Sena, and is expected to win though the BJP has given a ticket to Sena rebel and Jaiswal’s former close associate Kishinchand Tanwani. The All India Majlis-e-Ittehadul Muslimeen is contesting all of Marathwada’s seats, and has some strong candidates. It contested two seats in the state last time and forfeited its deposit in both, but the party says the Congress will lose Marathwada’s Muslim vote this time. Despite the large number of Dalit votes in Marathwada, Dalit parties scored zero here, but the BJP believes the alliance with the RPI will give valuable votes to BJP candidates. The BJP’s two MLAs from Marathwada are Pankaja Munde and Sudhakar Bhalerao. A five-fold growth in that tally could set the stage for the BJP in the state.